Web Site ?Copyright 2001-2009 by Carol Goldberg, Ph.D. 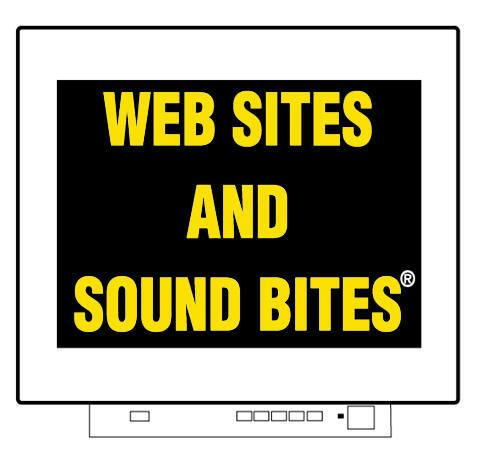 Web Sites and Sound Bites? is a Registered Service Mark and Catalyst Coaching SM is a Service Mark filed with the U.S. Patent and Trademark Office. All rights reserved. Some of these tips are very basic and some are reminders for seasoned computer users. They are to prevent avoidable problems and save you time. To be helpful to the most people, tips are generic or relate to the most widely used products, which happen to be PC computers and Microsoft's Windows XP Operating System, Word, and Internet Explorer (Version 6; note Version 7 in Beta testing phase is not widely used yet). Because these products are so popular, they appeal to attackers who want to cause the greatest havoc. Prevention is your best protection. Instead of trying to do them at once, take a look at them, then bookmark this page in your Favorites to revisit and see additions and updates. You can also print this out for easy reference. Whenever getting a new computer, file installation disks (with the product key # on each) in one rack so you can find them quickly if you ever need to fix a corrupted program or a computer crash. Store manuals on a nearby shelf. In a file drawer or loose-leaf notebook, keep tech support phone numbers, receipts, model and serial numbers, and other important information. Retain disks with earlier versions of programs, bar codes from boxes, and first pages of old manuals so you can save money by purchasing future updates instead of full versions and to get rebates. Always use a surge protector. They are available with and without battery back-up. The surge protector prevents electrical spikes from damaging your computer, while the battery back-up provides brief power to prevent loss of data from the time a power outage begins until you can save active data. Unplug computers (and other sensitive electrical equipment) during thunderstorms and prior to going away when storms may occur. In contrast to anti-virus programs, firewalls keep intruders out of a computer. However, both types of programs may be bundled together (ex. Norton Internet Security). Cable hook-ups are particularly vulnerable to break-ins. Hardware firewalls (such as in a hard wired router) offer excellent protection. Software firewalls should be updated so update them manually whenever you turn on your computer. People often neglect to protect laptop and notebook computers by not using protective features available in Wi-Fi routers (Wi-Fi Protected Access and Wired Equivalent Privacy) to conceal connections, change default settings, add passwords for access, and encrypt data. Anyone within 200 feet can tap into a wireless Internet connection, even when at home. It is amazing how many people surreptitiously use their neighbors' Internet connections or use wireless networks for identity theft. Public places (coffee shops, universities, towns, etc.) that offer Wi-Fi connections often leave their connections wide open and vulnerable to identity thieves. Remember to protect your computer before using wireless connections at home and away. Windows XP Service Pack 2 includes anti-virus and firewall programs that can interfere with such programs you've installed. You can use SP2, while selectively opting out of using those specific features. Your Internet Service Provider may also provide anti-virus and firewall protection, which may need to be reset for compatibility with what you have installed on your computer. Enabling ActiveX Control for Flash action scripts and plugins for video and audio, which are used on some web sites, risks allowing those sites to have full access to your Windows operating system. Thus, Internet Explorer should show you a warning that asks you whether you want to run software such as ActiveX controls and plugins. Don't turn off this default warning, which is important protection. Your permission response is per time, per page, not blanket permission, but be cautious about risking your computer's security. Get accustomed to using Windows XP's Restore feature. Prior to installing new software or making major changes that could crash or corrupt your computer, take a minute to create a restore point (to supplement those it automatically makes). Then if necessary, you can restore your computer to its pre-problem functioning within minutes. Don't be overly casual with passwords. Pick those unlikely to be guessed. Mixing letters and numbers together helps. Don't use the same password for more than one purpose. Hide your passwords in a safe place...and remember where that is! A high-speed cable connection can be 100 times faster than dial-up connections. Cable and DSL prevent tying up a phone line while using the computer and are not necessarily more expensive than the alternative of an additional phone line reserved for the computer. Unlike dial-ups, there is no waiting for a connection nor being disconnected. You can maintain the connection all day and use the Internet and e-mail whenever you want. Since cable and DSL enable using the phone and computer simultaneously, it's a good idea to have a speaker phone near your computer. Avoid keeping software programs installed that you never use. While data files take up little room on today's huge hard drives, you can store files you don't use and only want for archives on CDs, instead of taking up space on your computer's hard drive. Ever get stuck with an older version of a web site page instead of viewing a recently published page? It is a problem on your local computer, not the server. You need to clean out your computer's cache (storage) and should do so frequently. Computers keep files, which have been used recently for quick reuse, just as you might keep books you anticipate using soon open and nearby to avoid wasting time with trips to distant bookcases. To clean out cache, while in Internet Explorer, click on Tools at the top menu bar, then Internet Options, then under Temporary Internet Files select Delete Files and under History, select Clear History. When too many files collect, they also take up valuable space and slow down your computer. You can run the System Tool, Disk Cleanup, to delete and compress old files. Computers function fastest when related material is contiguous, rather than separated, just as you save time by keeping several books in a series next to each other rather than in separate bookcases. Putting related parts of files next to each other on a computer is called optimization or defragmentation. Unlike previous versions of Windows, XP rarely needs to be defragmented. Nevertheless, run an analysis with the Disk Defragmenter in System Tools occasionally to be sure. Spam mail filters from Internet Service Providers are helping reduce spam, but it is still overwhelming. Be careful about clicking an opt-out e-mail option that could verify to spammers that your address is active. Do not reply to offers or requests for information, even if they sound like they came from big corporations ("spoofing") because bone fide businesses do not ask you to send or verify your social security number, password, or other private information by e-mail or a web site they direct you to. (You can place a phone call to them to verify.) Such identity theft is called "phishing" and is based on the fishing premise that throwing lots of bait will result in some bites; an amazing 5% do. Such scams are akin to selling you the Brooklyn Bridge or asking you to transfer money on behalf of a wealthy individual from Nigeria. To manage e-mail and prevent it from becoming overwhelming, the first line of defense is to keep unwanted mail from entering your computer, using a spam filter that is tight enough to block junk mail, but loose enough not to block bone fide mail. Don't hesitate to tell people not to put your address on unwanted mailing lists and not to send unwanted mail. Next, be able to sort mail quickly. Since you probably have multiple e-mail addresses, you can use them to categorize mail and reserve one to give to places you suspect might sell their mailing lists. Make folders (ex. in Outlook Express, right click on Local Folders, new, and name each) for sweeping mail into categories (such as by level of urgency, topic, sender, things to keep for a particular purpose, things to archive for the record). You also can mark messages as read or unread (Outlook Express edit menu) and flag messages (message menu). Don't forget to delete mail you are finished with. How to find time to delete mail you don't want, sort what you want, and read what you want to read? Whenever you are on hold on a phone call. E-mail is not private so don't send private information in e-mail. Even programs that promise to protect e-mail and require being installed in both the sending and the receiving computers are not sufficiently secure. Passwords and encryption can be cracked quite easily since most people are not strict with firewalls and updating protective programs. If you read the small print on honest disclaimers, they talk about reporting break-ins, severing connections, and stopping future break-ins, but can't undo the damage once security is breached (akin to closing the barn door after the horse is out). We can encrypt pages with SSL encryption, as we do with credit card transmission, to be picked up on a secure server. However, this is not e-mail. When you want to send a message to a group of people, you can avoid showing a long list of addresses and annoying recipients by giving out their addresses. Go into your e-mail and click on View, then All Headers, create a message, but instead of putting addresses into the To bar, put them in the Bcc (blind carbon copy) bar. (Although there are ways to trace the addresses, blinding them reduces the likelihood that addresses will be harvested.) Since recipients will not see names, only undisclosed recipients, put a good description in the subject bar so they know it is really from you and not spam mail. Want to test your e-mail? You don't have to bother a friend to send you a message. Send one to yourself. (E-mail can travel to and from the same address.) Should arrive instantly. Don't let the mouse confuse you. Right click is to get a menu. Left click is to select from a menu. Only click once, except twice to open a file. To get a menu of useful functions, highlight holding the left mouse button down, release the button, point to the highlighted area and right click. The resulting menu will have useful functions, such as copy, paste, rename, and delete (the exact ones depend upon the program). The top bars are tool bars. The bottom bar is a task bar, which indicates what programs are open. When you minimize a program to the bottom task bar, you can click once on it to restore it to full screen. To save time locating information, whether in a Word document or on a web site, click Edit on the top tool bar, then Find, and list what you are searching for. If your computer behaves strangely, try to save active data and then shut down your computer. Wait a few minutes and then restart it. Sometimes doing this miraculously clears out conflicts, computer memory that has become overloaded and overwhelmed, and garbage. See our FAQs page for explanations about web sites and terminology. Revisit for additional and updated tips.